Last week NASA received a weak signal from Pioneer 10, twice as far from the Sun as Pluto and speeding toward the constellation Taurus. May 3, 2001 -- On April 28th, a Deep Space Network antenna in Madrid detected a curious radio transmission from the constellation Taurus. The feeble signal registered little more than a billionth of a trillionth of a watt -- nonetheless, it had a powerful effect on scientists. The signal was intelligent and it came from an interstellar spacecraft about twice as far from the Sun as Pluto. It was Pioneer 10! Right: An artist's rendering of the Pioneer spacecraft in deep space. Ground controllers had been listening for the distant space probe since last August with no success, raising fears that its radio transmitter had finally run out of power after 29 years in space. But, says delighted Pioneer 10 project manager Larry Lasher at NASA/Ames, "Pioneer 10 lives on!" Pioneer 10 was launched on March 2, 1972, from Cape Kennedy aboard an Atlas Centaur rocket. At the time it was the fastest spacecraft ever to leave Earth. It was the first spacecraft to travel through the asteroid belt, the first to visit Jupiter, and the first to use a planet's gravity to change course and reach solar-system escape velocity. Now, as it races for interstellar space, Pioneer 10 faces its toughest challenge yet: the inexorable march of time. "We're way beyond our warranty," says Lasher. "Pioneer 10 was only intended to last 21 months, but it's been going for nearly 30 years." The craft is powered by electricity derived from the warmth of decaying plutonium 238. Although the half-life of the isotope is 92 years, the thermocouples that convert heat energy to electricity are degrading faster. Mission controllers suspect there won't be enough electricity to power the radio transmitter much longer. Scientists are monitoring Pioneer's faint signals as a test of communications technology for future interstellar missions. "The Advanced Concepts Program is funding this effort," he continued. "They're learning how to extract coherent data from a noisy signal using chaos theory." Far-flung Pioneer 10 is the perfect guinea pig for such an experiment. Its feeble signals travel nearly 11 hours to reach Earth from a distance of 7.3 billion miles -- that's 78 times farther from the Sun than our planet. On December 8, 1992, when Pioneer 10 was "only" 5.2 billion miles away, the craft experienced an unexpected course change. Astronomers think it was diverted slightly by the gravitational pull of a Kuiper Belt Object. Circling the Sun at vast distances beyond the outermost planets, Kuiper Belt Objects are asteroid-sized bodies similar in composition to icy Pluto. of this diagram shows, only Pioneer 10 is moving in the opposite direction to the Sun's motion through the galaxy. Hopefully Pioneer's radio will still be transmitting when the historic crossing occurs. It could happen, says Lasher. After all, Pioneer 10 has beaten the odds before. For instance, Pioneer 10 was the first spacecraft to cross the asteroid belt between Mars and Jupiter. Before that crossing, no one knew how many rocks and grains of sand speeding through space at thousands of miles per hour would hit and possibly disable the spacecraft. 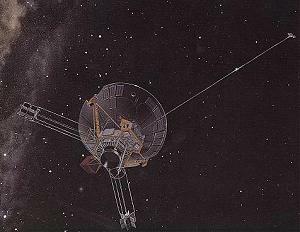 Pioneer 10 made the journey nearly unscathed, thus opening the way for other probes to explore beyond Mars. Later, the craft endured an intense shower of radiation inside Jupiter's magnetosphere -- and kept right on going! After Pioneer's power runs out, the 570 lb spacecraft will have a new job: ambassador to the stars. The probe will have its first stellar encounter in about 300,000 years when it passes within three light years of the red dwarf Ross 248 in the constellation Taurus. Ross 248 is an 11th magnitude star 10.3 light years from Earth. In the next million years, Pioneer 10 will pass ten stars at distances ranging from three to nine light years, and will probably still be traveling through the Milky Way galaxy when the Sun becomes a red giant and destroys our planet five billion years hence. The probe wasn't so long-lasting in its first and only movie role, Star Trek V: the Final Frontier. A trigger-happy Klingon named Captain Klaa blasted Pioneer 10 to smithereens for target practice. Of course that was just a model of the spacecraft. TRW, the company that designed and built Pioneer 10 under contract with NASA Ames, provided Paramount Pictures drawings for the Star Trek model. Says Paul Morgan, a video producer for TRW's IMAGE Center, "The computer model was a good one, but a cameraman complained that it was hard to light." The Klingon hit it anyway. Pioneer 10 bears a message for any life forms that it might encounter on its trek across the galaxy. A gold-anodized aluminum plaque (pictured above) was designed by Frank Drake and the late Carl Sagan and bolted to the spacecraft before it blasted off in 1972. The plaque's engraving depicts a man and a woman, a map of Earth's solar system, and other symbols that may help intelligent beings interpret the message and understand something about the spacecraft's creators. As an emissary to the galaxy, Pioneer 10's greatest and most bizarre adventures may still lie ahead. Pioneer Home Page - background, images, and mission status reports from NASA/Ames. Pioneer Mission Description - find out more about the history of Pioneer 10 and the instruments it carries. 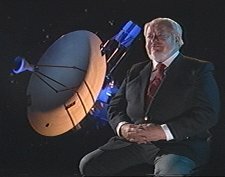 Pioneer 10 videos -- This Pioneer 10 silver anniversary web site offers a selection of video interviews with some of the key scientists and engineers who participated in the historic Pioneer project.